LondonJazz News: What's so special about daCarbo? Quentin Collins: Technically speaking, the carbon fibre alignment in daCarbo construction aims to optimise the instrument's vibration. The suppression of the vibration basically means there is less wasted energy in the air column. The result is an instrument that is far easier to play across all registers, allowing the player to concentrate more on the artistry of the music. LJN: And how foes it feel to play? QC: Personally, I always feel like I have an intimate experience with the music I'm practising or performing when I play my daCarbo trumpet. I also like the idea that Andi Keller, the designer and owner or daCarbo was a material scientist & semi-professional trumpeter who collaborated with master trumpet designer Werner Spiri to bring two worlds together in its design. LJN: When and how did you discover daCarbo? 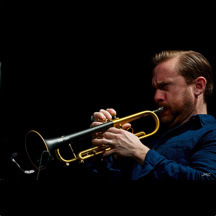 QC: daCarbo is a relatively new company which I'd never heard of until I was performing a concert in Marciac early 2016 and had somehow left my trumpet back at home in the UK. A local brass repairer and instrument hirer came to my rescue, offering a choice of no less than 5 trumpets from which to choose for me to play that night. The first 4 were pretty standard- a Getzen, a Vincent Bach, a Yamaha & a composite that he'd made himself. The 5th & final horn really caught my eye. I immediately loved the look of the carbon fibre, and from the first note I played on the horn I knew I had to own & play the daCarbo trumpet! I was put straight in touch with Andi Keller & the rest was history- that was a good night in my life! LJN: How long have you been playing daCarbo trumpets? QC: I have played on my daCarbo Unica model for about a year. I first got my custom Unica model in July 2016. LJN: Who else plays daCarbo instruments? LJN: Describe in your own words the sound of daCarbo instruments.